Currently I am sitting in an internet café – a restaurant really (a very good one called Pescados), rushing before they close to update my blog with stories and photos from the New York to South Africa leg – see below. Tomorrow, Saturday January 17, 2009, we are off sailing to Melbourne Australia; leaving first thing in the morning. The boat is ready and the food is packed. As an aside, Doug S and I escaped and went for a hike into the mountain by Simon’s Town (the extent of our exploration of South Africa). It gave our legs a good last work out before the sailing trip and it was a pleasure to smell the aroma of the dirt and vegetation before filling our nostrils with salt air. 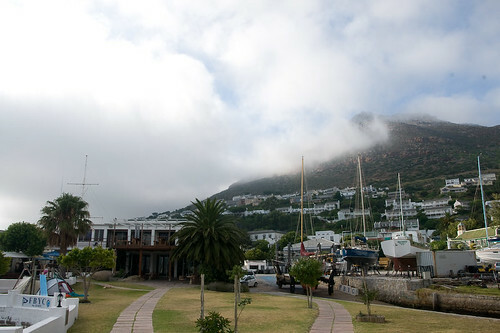 It has been eight days since we landed in Simon’s Town, South Africa and it has been a wonderful place. 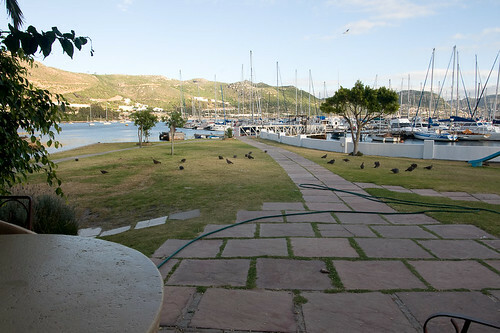 The boat is resting up at the False Bay Yacht Club. The people there have been wonderful and extremely helpful. Everything we need to prepare the boat for the next leg to Australia is there. We have spent our days working on the boat or running errands so, regretfully, I have not explored the area as much as I would have liked – an opportunity missed and a reason to come back. As I write this I am sitting outside of the club looking out seeing the bay surrounded by rocky shrub covered mountains, which when the wind blows are covered by thick blankets of white clouds. 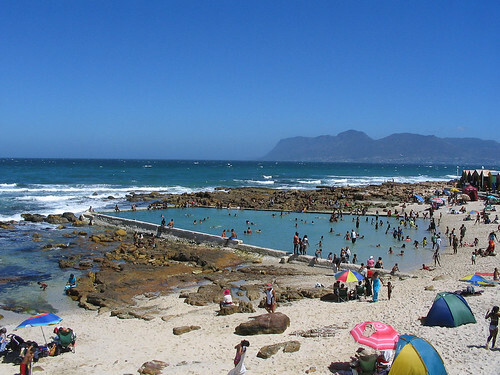 Buildings dot the foot of the hills around the bay and rocky outcrops and white beached meet the cool waters of False Bay. The weather is very much like the Mediterranean; cool nights and warm days chilled by a strong breeze. Most of what I have seen has been only on the rain going to Cape Town from Simon’s Town and back (to check in and out of emigration and customs). All we saw in Cape Town was the touristy waterfront with its malls and restaurants (very nice if you like that sort of thing). 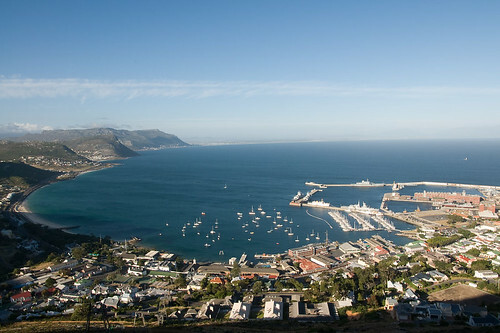 Simon’s Town is a small, and is the location of the South African navy. The main strip is near the water and is mainly tourist shops restaurants. There are no large hotels or resorts here. Above the main street, working up the steep hillside are the houses; small blending beautifully in with the natural surroundings. Looking at a pamphlet on exploring Simon’s town there is lots to see and do, from going on scenic hikes to cage diving to see great white sharks. There are also less adventures thing to do like wine tours and seeing penguins along the shore. After day of working on the boat and having a couple of cold cheap beers at the club, we would go and eat at one of the many restaurants. The food has always been very good and the service excellent. And the cost? In a word – cheap. With an exchange rate of 1 Rand = 0.1245 Canadian dollars, food, wine, beer and services are surprisingly inexpensive. We normally spent between R100 – R150/person of a multi course meal leaving us stuffed and happy. The cost for boat maintenance at the yacht club has been a surprising pleasure. And it only cost us about R200 to do the laundry of five guys who just spent 69 days at sea. I wish I could spend more time here and explore, hiking in the hills and along the Cape and swimming in the cool waters. At least I have enjoyed sitting at the club letting the morning sun warm me up while gazing out at the bay and sunlit mountains. The pace of life is relaxed here and has that feel as a place that Earnest Hemmingway would have enjoyed. I now know what hell would be like. Take your favorite activity select the most unpleasant part of that activity and make it never ending. For me it would be sailing. 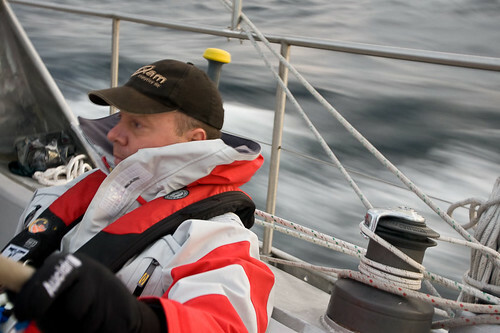 Sailing upwind on rough seas at a 30-degree heel and never reaching land. After the storm, we continued eastward hard into a southeast wind. But we were not only going east we were slowly going north. We wanted south; the devil wind had us and tormented us. Frustration built as the tried crew with sunken eyes looked at our track. East was good, the miles towards Africa declines quickly. It was the fact that we were heading to Angola instead of South Africa that darkened our mood. The wind would mockingly shift slightly allowing us to go southeast toward South Africa. Moods would quickly rise, calculating the short days to port; then just as quickly the wind would shift back once again forcing us just north of east. Our temper turned with the wind back down into the dark gloom, the shortening days growing long again. The days and wind shifts continued, never ending, and like the swells, our frame of mind rolled up and down. Tiring of this torture the evil wind shifted allowing us to bear straight for our target. But there was a price. We had to sail hard on the wind (nothing new), pinching, squeezing to the point of luffing the sails to make our mark. The wind in the rigging sounded like the call of the dead. Add to that the minions of sharp and steep waves whipped up by the wind. The boat would continually fall on to a back of a wave and land with a bone shattering impact. Below, it sounded like the hammer of Thor against the hull. Everybody would flinch, wondering if the rig would give way. Each time our beast of burden slammed against a wave it would shudder and stumble to a stop, then pick itself up again and continue to carry its physical and emotional fatigued crew to their destination. It never seemed to end. Was I in hell to sail into the wind against bounding waves for the rest of eternity? It felt like it. For 17 days, we struggled trapped on an emotional roller coaster that we could not get off. 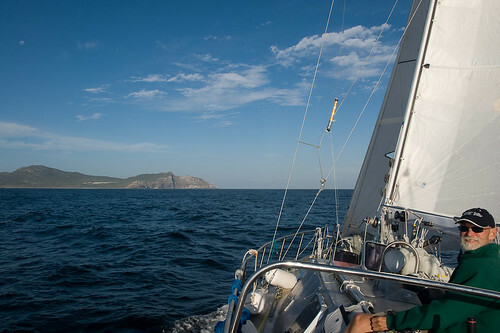 Then, as if given a reprieve, the southeast wind died replaced with a northwest angel that allowed us to sail on a beam reach around the Cape of Good Hope under blue skies and a setting sun. 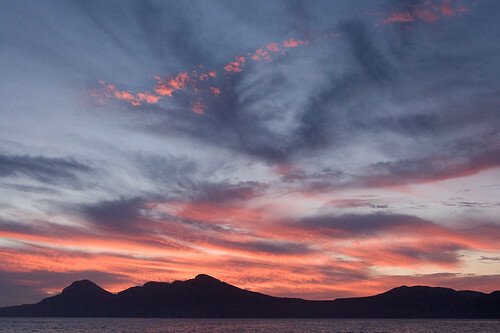 Beneath a clear night sky with a bright moon approaching full, we motored-sailed into False Bay Yacht Club in Simon’s Town, South Africa for a well-deserved break and rest after 69 days at sea. Be careful what you wish for. It is a tired old and overused cliché, but in our case, it was appropriate. December 19, it was the middle of the night and I was on watch trying to sail; but there was no wind. The GPS showed us going nowhere with 0 knots over the ground. I sat behind the wheel doing nothing and wishing for wind. At the end of my watch, I went to bed leaving Doug S. at the helm wishing for wind. The next morning, on December 20, the breeze had filled in and for the remainder of the day pleasant sailing under 20 knots of wind; our wish came true. This continued into the next day. 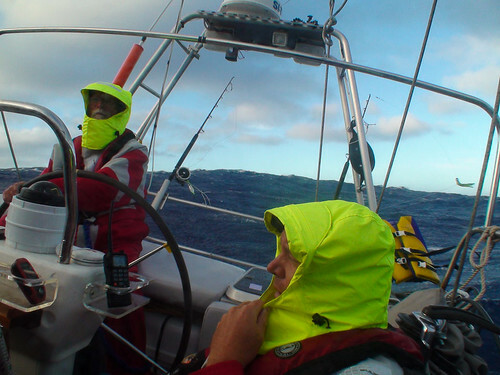 Conditions started to change during my shift when the winds, coming from the east, started to build to over 25 knots. The crew tucked in a double reef and furled in the jib. 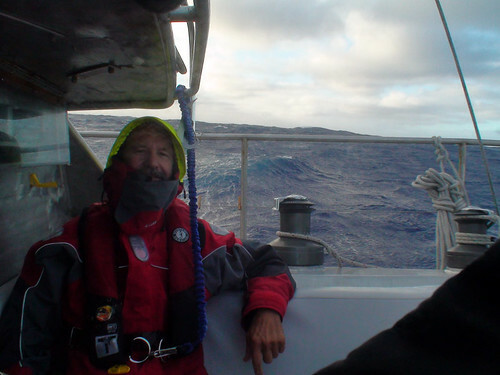 As the evening passed the winds continued to grow, peaking at 35 knots; Doug S was on watch. Before I retired to the aft port bunk to try to sleep, I asked Doug how everything was. He response was, “We need a forth reef”. Near the end of his shift, the boat was running 12 knots with the wind. We were now heading north; we wanted south so John decided to drop all the sails and go bare poles. Early the next morning, December 22, I crawled out of my windowless cave to see that we were in a gale – wind speeds were hitting 55 knots. The door to the cockpit had been closed and dogged down. Looking through the door window, I saw John, Stuart, and Doug G sitting in the cockpit. I put on my foul weather gear, opened the door and struggled out. The wind so loud that it felt like a hundred freight trains screaming inches by. Looking out I saw the chaos the wind inflicted on the ocean; we were surrounded by mountains. One moment we were in a deep valley looking up at the mountaintops with sheer cliffs that looked like sheets of ice; the next the boat was sitting on top of a wave like the Ark upon the mountain. Bright sunshine shone through the wave tops just before they would break in a white froth making them look like majestic cathedrals perched high in the air, the colour of aquamarine, like thick pieces of broken glass. 29 degrees and 53 minutes south by 16 degrees and 37 minutes west at about 8:00 am GMT, the boat like some great beast that had been shot staggered and lost its footing under a collapsing wave; then fell to port and slide down a wave. Time stood still. At that moment, after having tried to take some video and pictures of the raging sea, I was back in the port aft bunk trying to sleep in spite of the turmoil outside when I felt the boat fall over. I sat up and braced myself thinking, “We are going to roll”. Looking out the bunk opening, I saw water pouring in. Doug S was standing between the galley and the pilothouse by the navigation station, looking aft. Bracing himself as the boat started to slide he looked out the port windows and saw nothing but blue water. When the water started pouring in Doug S quickly shouted, “The windows are ok, it’s coming through the vents” easing everybody fears. Captain John was in the aft starboard cabin said he felt a slight disappointment towards the boat for being knocked down. Later all agreed it that the boat had preformed admirably in the conditions. John’s brother, Doug G, was a sleep on the starboard settee and was initially unaware of the situation. Stuart had the worst view of it all. 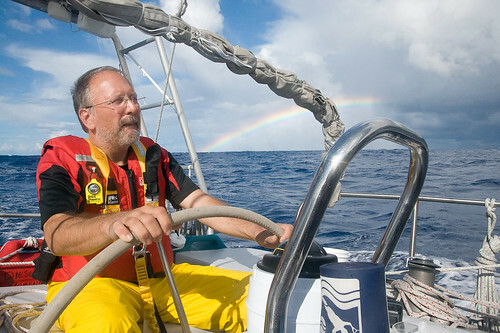 He was outside at the helm trying to maneuver the boat over the gigantic waves. Nevertheless, the one wave, collapsing underneath, caught the boat pushing it on its side. Stuart, who was thankfully tethered on, was thrown to the port rail. He found himself underwater, from hearing the screaming wind to tranquil silence. Staring at the surface, seeing lines, floating debris, and the blue sky above, he told himself, “Hold on, hold on, hold on”. Time had stretched as the knockdown happed, but then with a shudder it snapped back as items in the cabin flew from starboard to port. Books, ipods, unsecured tools, and other fragments flew through the air like missiles and impacted with a crash. The laptop barely missed Doug G as he woke with the realization of what just happed. Everybody checked with each other to see if everybody was ok. John opened the door and screamed, “Are you ok Stui?” A wild eyed and slightly shocked Stuart responded that he was fine and continued at the helm. We had survived a knockdown in the South Atlantic. The waves and winds continued for a bit but within a few hours, the waves decreased in size and the winds were below 20 knots. We had suffered no injuries and the boat suffered no damage; with sails back up, we continued onward to South Africa. It has been about 2 weeks since we entered the Southern Hemisphere. During that time, the propagation of the ham radio has been poor. Only now, in the last few days is it coming back. The blog updates have been done by sat-phone. A fair bit has happened since I last wrote. I shaved my head and started to grow a beard – I always said that when I lost my hair I would grow a beard. Wildlife has been plentiful and a joy to see. I observed a Cory’s Shearwater hunt for flying fish. 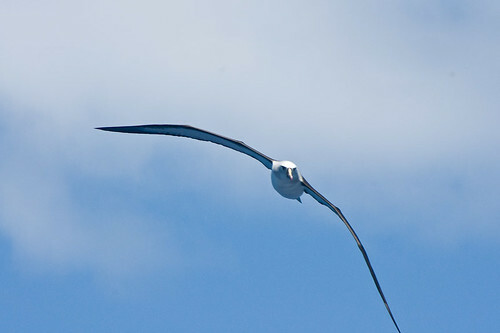 The seabird would dance about the boat swooping within feet of the hull to the top of the mast then back down, its wings slicing the water as it rode inches above the waves. Then up into the air again, craning its head back and forth looking and changing direction in an instant. The bird would then suddenly stop, collapse its wings and dive disappearing beneath the sea; then up again to start all over. We saw bright pink jellyfish sailing by against the deep blue sea. We watched a pod of dolphins on the hunt, jumping high clear above the waves as they raced by us quickly disappearing into the horizon. I heard, in the middle of the night alone on watch, the breathing of whales. The deep blowing whooshing of the breathing hole sounded like they were right next to the boat. But on the moonless night I never saw them. 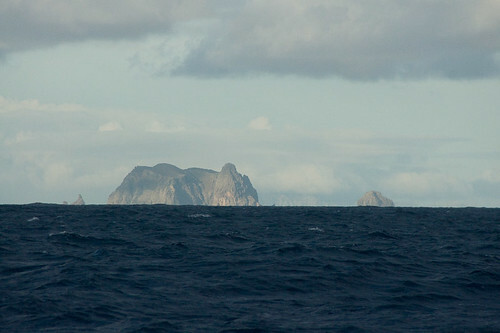 We saw our first landfall as we past 12 miles east of the Martin Vas Islands at the breaking of a new day. The jagged and stark cliffs gray against the morning light – oh how fun it would have been to go exploring a place few will ever see. The weather and wind has been kind and cruel. 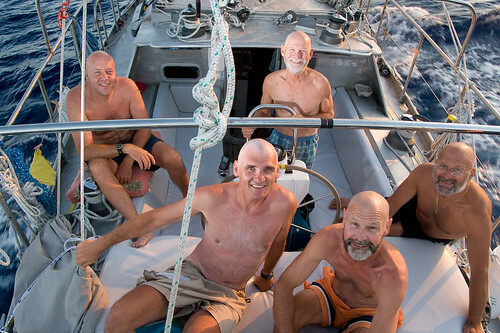 After crossing the equator (see story below) the sailing was fantastic. Again, we were hard on the wind but the ocean was flat and gentle and the boat put the miles beneath us day after day under blue skies. 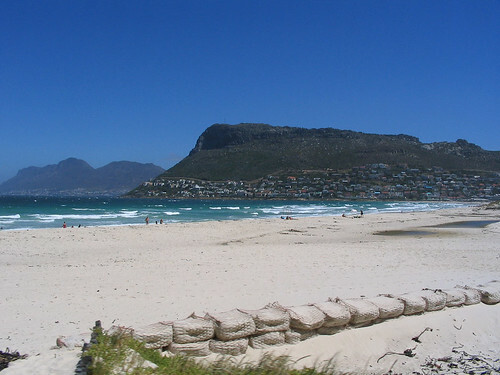 We started counting the days to Cape Town. Then the winds shifted. 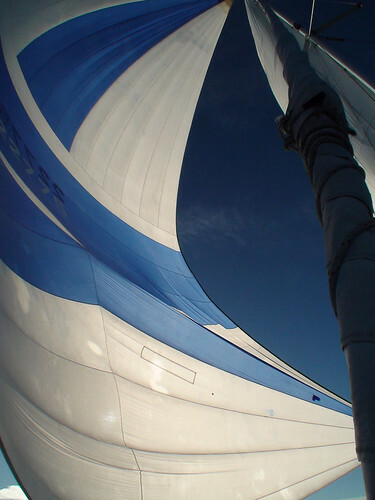 First, it was good as we could fly the spinnaker and sailed with it for a few days. But the wind died as the boat glided along the edge of a frontal system. 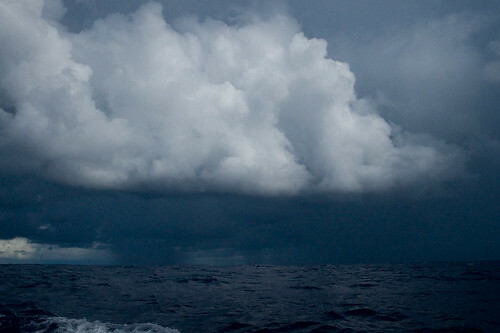 On our portside, towards Africa, there were blue skies. To our right, towards South America, the clouds were flat and steel gray. Now we struggle to make our desired heading to Cape Town. The winds are variable, both in strength and in direction. We try sailing on starboard tack but we head towards Argentina, so we try port tack only to be heading northeast towards Northern Africa. 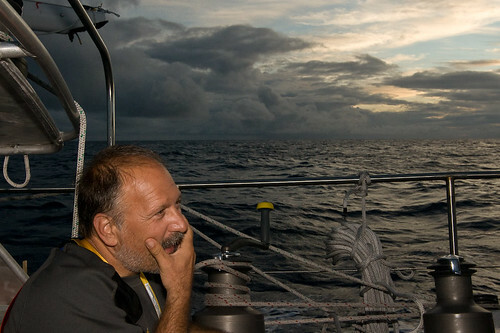 We continue to sail the best we can and enjoy our surrounding waiting for more favorable winds that will come our way. This is ocean sailing and we deal with it as our anticipation and desire of landfall grows with each passing day. The Inter-Tropical Convergence (ITC) Zone, or the Doldrums, was not what I expected. I expected bright blue skies, a brilliant burning sun with intense humid heat and no wind; all punctuated with violent squalls hitting us with driving rain and wind. Entering the ITC Zone happened at a distinct point. We had been sailing under spinnaker for two whole days in what we have called the NE trades. Then on November 30, late in the morning (mid afternoon local time – we have not adjusted our clocks since we left New York) we saw a gray wall in the distance. Approaching it, the wind quickly died to a whisper. Heavy showers doused us as we entered the gray boundary. On the other side the rain stopped. It felt like we had entered the twilight zone. The days spent there were colorless and dull. Sunrise and sunsets were void of color and there were no rainbows. Dark low clouds blanketed the sky and the sea was an inky black. Everyday, as the hot and humid hours passed, the clouds would build into great dark gray fortifications where the rains would come. Quickly gloomy steel curtains circled the boat, our universe shrinking to only a few hundred feet. Then the rains would come hard and fast. Raindrops hitting the water by the boat looked like glass shards spread across the water. Waves would smooth out looking like distant gentle rolling hills shrouded in a morning mist. During these downpours there would be, on deck, five naked men hooting and hollering with delight like children playing in the summer rain. Through out we had wind, contrary to the stories told about the doldrums. During the day, the breeze was light at 3 to 6 knots and in the evenings, the wind built to 13 knots at times. The squalls were gentle. Rains were heavy but the winds never went above 20 knots. The boat was always moving as if pulled by a string; ghosting along making slow and steady progress south with sails full. 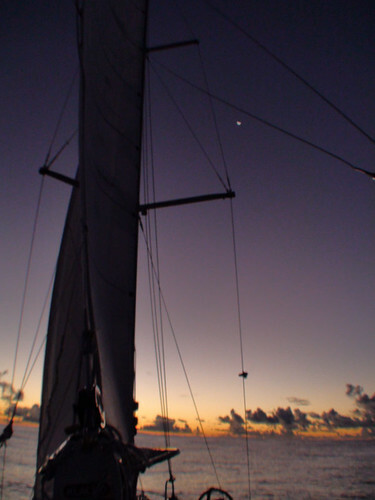 Never did the sails or crew feel the frustration of being becalmed. On December 4 at 13:57:42 ship time (17:57:42 GMT) we passed the equator. Celebrations by the crew involved John acting as King Neptune and his brother, Doug, playing his sidekick; doling out playful punishment for crimes against the sea. After we ate chocolate cake and drank champagne. By late evening a South-Southeast wind picked up to a steady 15 knots, gusting to 20+ knots. We were sailing fast once more hard on the noise. After 4 days of surreal sailing in a monochrome world, we had left the ITC Zone as quickly as we had entered it. Becalmed. A windless sea is a sailor’s worst frustration. This is where we found ourselves; like men in a parched desert looking for an oasis we searched for wind only to find mirages under clouds. The first day (November 21), we welcomed the lack of wind. The calm gave us rest from the weather we had. We soaked up the morning sun, enjoying fresh fish cooked in beer batter. By midday, the wind filled in and the boat was cruising at around 6 knots. Rested, we settled in as the evening approached, relieved that the wind had returned; but the wind was only playing a cheeky game with us. Early in the morning, the breeze had faded away to nothing. The sails whipped back and forth angrily in the long deep swells, cracking like whips. Curses of frustration from the man on watch were heard below while others tried but failed to sleep. In despair, the engine was turned back on, the iron sail pushing us forward. 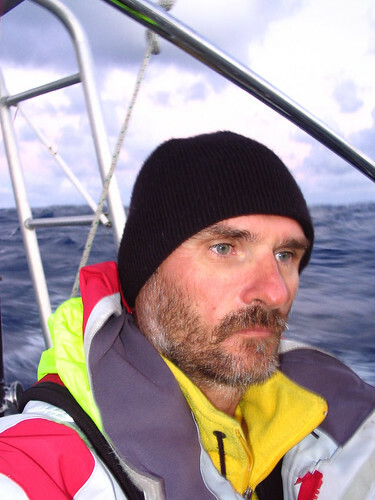 Day 2 (November 22), the wind continued to hide from us and we motored on, eating up diesel. The crew makes the best of a situation we cannot control. Stuart took a shower in the rain and Doug G. reeled in another fish just in time for lunch, its bright metallic green blue quickly fading in death. However, the lack of wind and fuel consumption weighed heavily on everybody’s mind and the crew discussed whether we should stop at the Cape Verde Islands for fuel. Piracy, the headache of customs and time delays make us hesitate. As we talked, the engine died. Silent, we look at each other. Tank 1, 200 gallons, has run dry – one third of our supply. We had not anticipated the use of so much fuel so early, relying on the northeast trades, which have yet to show themselves. We need the fuel to punch through the doldrums at the equator. Cape Verde Islands now looms as the only option. Day passes into a clear moonless night. Stars cover the sky from horizon to horizon. Far, far in the distance, the horizon would flash with light from the thunderstorms ranging over Africa. The ocean was calm as a sheltered bay. Seabeams glistened in the darkness, washing off the wake of the boat. A glow came off the rudder like a hot phosphoresce plasma trail from a jet engine. We motored through the night. Day 3 (November 23) and the eastern sky glowed brighter, the sun rising a bright orange yellow fireball shining through the low flying clouds. In the west, a heavy bank of rain clouds burned light yellow at their tops, against the light blue morning sky. Lower, their colours changed to pinks then purples then grey as their bottoms met the sea. There was now a whisper of a breeze but we still motored on. As the morning sun rose in the sky so did the wind growing steadily, finally reaching 13 knots. Quickly we turned off the engine and sails set, the boat bucking with joy as the she pranced along at 6 knots. It is now November 26 and we have been continually sailing, the winds having returned. It is not a strong wind at only 13 knots, sometimes dropping to 7 knots. We are still sailing hard on the SE wind waiting for the NE trades, but we will take it, happy the winds have returned, talk of stopping at the Cape Verde Islands has dissipated along with the sailor’s word frustration of being becalmed. The Trade Winds and tales of idyllic tropical downwind sailing are only stories told by old sailors to lure the young and naive. Sailing for 18 days and we have yet come upon such fabled conditions. Our voyage is an up wind struggle, the breeze continuously in front of the beam. We are riding the edge of one or more frontal systems, making our way east-southeast trying to avoid the worst. The cheeky winds play with us. At times, it gusts up to 30 knots, chopping the heads off waves like a guillotine sending salty spray into the air and forcing us to arm-wrestle the wheel. It then drops to a whisper leaving us to the mercy of the rebellious waves as they toss the boat around. Sometimes the wind is courteous, blowing just right allowing the boat to reach hull speed and ride the waves with a gentle role. We are surrounded by cumulus nimbus clouds. Large, their bellies black full of rain. Short and heavy downpours hit us washing the boat as we pass under the clouds. During the day, the heavy rain can be seen in every direction for miles. Rainbows, created by the bright sun shining through water droplets, radiate brightly all around us before disappearing. At night, lightening lights up the night sky and the heavy clouds obscure the moon and stars. Sheets of rain conceal the horizon creating a dark void into which we sail. The mood of the crew is good as we all get along and have distractions to keep us occupied. 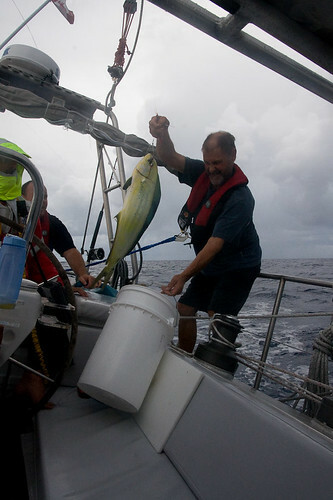 Today (November 18) we caught three dolphin fish – our first; Captain John acted like a little boy who had caught is first fish ever. We ate well having fresh fish for lunch and dinner. We give thanks for their sacrifice. Yet, despite the good humour , frustration seeps through the crew. The crew is tired of the upwind sailing, excellent it may be; tired of the inconsistent winds making sail selection difficult; and tired by not having the trade winds promised by everything we read. We have lost a week, perhaps more, by not having the expected conditions that have reduced our speed significantly, as we fight the wind and waves. Everybody wonders how long it will take to reach Cape Town. Hope prevails, however. We know that part of sailing is being at the clemency of the winds and having to deal with what is dealt us – that is part of the adventure. So we continue to sail to the edge of the world in search of the fabled trades. No doubt you know, if you have been following the Falcon GT blog, that we have past through the heavy weather to find ourselves having some fantastic sailing. The winds have been variable, normally ranging from 8 knots to 20 knots, since about November 10. The deep navy blue seas are now flat with deep long swells and the winds are more to our beam allowing the boat to slip smoothly through the water. 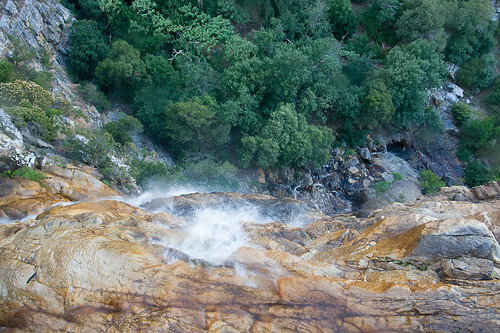 The acrobatics down below are no longer required, allowing us to prepare better meals and sleep more soundly. At times, when lying in my bunk, I cannot feel the movement of the boat; only the water rushing, like a waterfall under the hull. Well rested and feed, the crew has been busy cleaning, doing laundry, and making minor improvements to the mechanical systems of the boat. More fruit and vegetables with the onset of decay were thrown out. There were mutated oranges that had grown a green fur and when tossed overboard they exploded like a toxic smoke bomb on impact with the water. Along with the exhilarating sailing, the scenery has been spectacular. On November 12, we watched the sunset ignite the eastern sky ablaze while, at the same time, the full moon rose to the west painting its skies with pastel pinks and blues. The next morning, during my watch, we sailed into rain showers. It was wonderful as the fresh rain washed down on me. I could taste the salt being washed out of my hair. Massive rain clouds surrounded us as far as the eye could see; tall with grey white tops and their bellies black and heavy with rain. Behind us a rainbow glowed created by the morning sun. There is a darker cloud forming, however. We have been informed of a depression forming off the coast of Africa that could develop into a big storm. It is still too early to call, but we are making good speed East Southeast in hopes of missing whatever happens to develop. It has been the same for the last 5 days – the same east wind, the same big waves with their white froth hair, the same constant salt spray, the same starboard tack hard on the wind. For the last 5 days, the boat has been rocking back and forth, and from side to side. Down below it is physically taxing walking from one end to the other. The simple act of going to the bathroom is an acrobatic challenge that requires a few hundred calories of energy. More then the physical challenge is the mental fatigue of this sameness. It was not supposed to be this way; fighting against the wind day in day out. The crew longs for the trades and running with the breeze. Nevertheless, there are moments that all the fatigue and frustration disappears replaced with wonder and pleasure. Like seeing the sunrise during morning watch and witnessing the waking of the day with salmon pink skies turning to fire yellow that silhouette the grey black cumulus clouds; watching the black sea igniting to dark pink, red then burning yellow until everything turn to silver grey – the sunrise over.